Barely two months after its early July launch, the Sky Go service has recorded its one-millionth download. 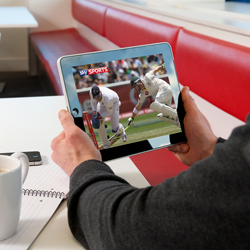 Writing in BSkyB’s ‘Sky Views’ company blog, Holly Knill, Head of Sky Player and Mobile TV, has shared some insight into how customers have been using Sky Go since its launch as well as some significant milestones that had been reached. “From the excitement of the start of the Premier League season, to the dramatic riots across the UK, there’s certainly been a lot to keep up with, and across iPhones, iPads, computers, and Xbox, Sky Go has enabled Sky customers to make the most of their TV subscription, regardless of where they are,” she wrote, noting that the performance of Sky Go thus far suggested that this convenience was really appreciated, revealing that the Sky Go app had recently recorded its one-millionth download. “On top of that, in August our customers watched over 40 million pieces of content on Sky Go, 85 per cent of which was live channels and 15 per cent on-demand,” she advised. She revealed that the demand for sports streaming was also boosted by the surge of anticipation that developed around football’s transfer deadline day (August 31st) on Sky Sports News. “Transfer deadline day has grown into a key fixture of the Premier League calendar, an action-packed 24 hours with Sky Sports News providing a constant stream of breaking news and analysis throughout the day. Judging by Sky Sports News accruing the highest number of views for a single channel since launch on August 31st, the ease and convenience of checking up on the latest developments using Sky Go was something that users valued. In fact, nearly half of Sky Go usage was on mobile that day, suggesting users appreciate being able to keeping abreast of all the latest developments while on the move,” she observed. She suggested, nevertheless, that it hadn’t all been about sport. “Thanks, among other things, to its much-lauded coverage of the London riots and social unrest in Libya, Sky News also features in the top five most watched linear channels on Sky Go during August. And on computers video-on-demand has performed strongly, with movies leading the way, with Shrek Forever After, The Other Guys and Piranha 2010 making up the top three most downloaded pieces of content last month. Aside from movies, Sky Go users are also embracing Sky’s support for home-grown UK content, with Sky1 HD’s recently recommissioned comedy Trollied appearing in Sky Go’s list of the top most requested VOD programmes in August, complementing what was already the biggest UK comedy launch in multichannel history,” she revealed. “As consumers increasingly get more and more familiar with viewing TV on the go, we understand that they’ll want the very best viewing experience possible. In the future, it will become even easier for Sky customers to enjoy Sky Go on the move, thanks to our recent acquisition of The Cloud, Europe’s leading network of public access Wi-Fi hotspots. Sky Go’s integration with The Cloud will allow customers to enjoy free access via thousands of wireless hotspots throughout the UK and Republic of Ireland, so they can enjoy the highest-quality streaming of the content they love while out and about,” she advised.